WINSLOW — With just a few weeks left in the regular season, the Winslow High School football team is looking to improve and fine tune as it enters the playoffs. On the other hand, Gardiner is still dogged by the same mistakes it was making in early September. 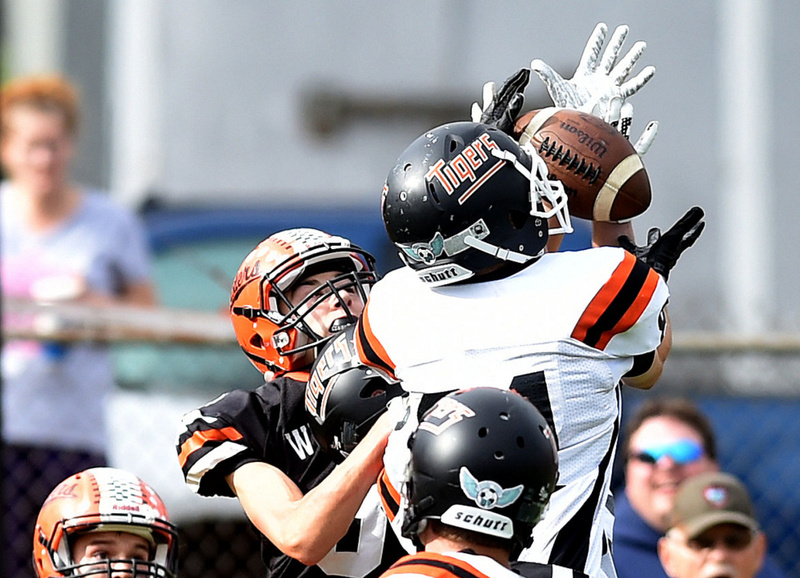 On Saturday at Poulin Field, Winslow forced four Gardiner turnovers, turning two into touchdowns, to pull away with a 41-7 Class C win. Winslow is now 5-1 in Class C North, while Gardiner dropped to 1-5 in Class C South. This was still a close game, a 14-7 Winslow lead, when Gardiner’s first turnover shifted momentum to the Black Raiders midway through the second quarter. 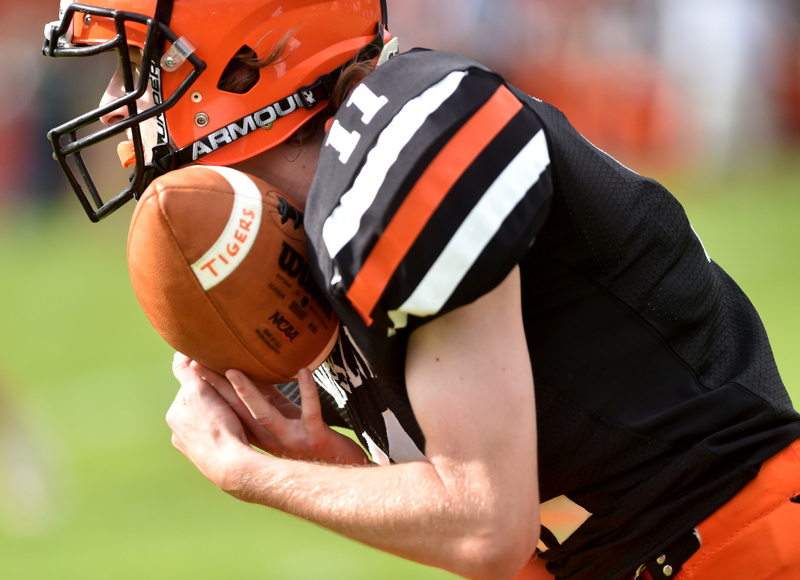 Tom Tibbetts intercepted Cole Heaberlin at the Gardiner 45, and returned the ball to the Tiger one yard line. Winslow quarterback Ryan Gagnon scored on a keeper on the next play, and the Black Raiders led 21-7. 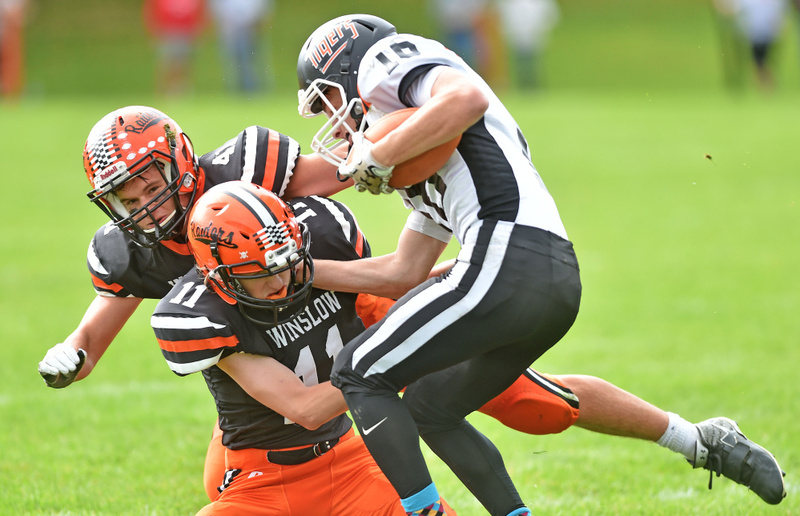 Gardiner lost a fumble at the Winslow 15 in the final minute of the second quarter to kill a potential scoring drive, and lost two more fumbles in the second half. After recovering a Gardiner fumble at the Tiger 27 midway through the fourth quarter, Ryan Fredette ran for a touchdown on the next play, pushing Winslow’s lead to 35-7 with 6:39 to play. Fredette (20 carries for 141 yards and three touchdowns) added a nine yard touchdown run with 3:46 for the game’s final score. Siviski praised his offensive line, which helped the Black Raiders control the ball and run for 196 yards. Winslow took a 7-0 lead with 6:21 left in the first quarter when Ben Dorval ran 35 yards for a score. The Tigers answered on their next drive, going 80 yards in nine plays, scoring when Dimitri Paradis caught a 32 yard touchdown pass from Heaberlin. With 18.5 seconds left in the first quarter, Fredette scored on a one yard run to give the Black Raiders a 14-7 cushion and the lead for good.